Crist has not jettisoned his support of regulations on emissions, but he did recently give a nod to GOP claims that climate legislation represents a major tax on industry. When asked about the claim, Crist told the Miami Herald, "Well, it may be [a tax]. That may be accurate." Draper of Audubon said that kind of statement may hint at cooling from Crist toward the specific climate bill currently being considered in Washington, though he still believes that Crist generally supports action on climate change. "He seems like he's moved on the federal climate bill," he said. "It seemed to be an attempt to kind of distance himself from the current legislative proposal and to say Florida would not benefit as much as it should from any legislative proposal." The big litmus test, though, will be who Crist appoints as a placeholder to serve out the rest of retiring Senator Mel Martinez's term. 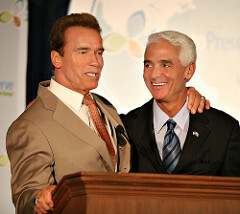 The odds are good that Crist's pick will cast a vote on a major climate bill in the Senate later this year. Environmental groups are already pressuring Crist to appoint someone who reflects his views on energy and global warming. But, of course, if Crist appoints a green Republican who votes for a climate bill, he risks the wrath of the GOP base in next year's primaries. So what's it going to be?